The picture shows Curt Hutchins, president of Eaton Asia Pacific, speaking at the opening ceremony of the Technical Day for Infrastructure Construction and Power Industry. 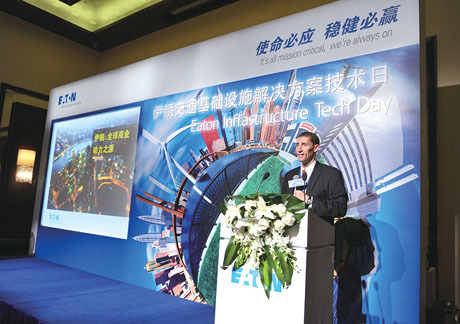 On May 28, Eaton Corporation, the world's leading manufacturer of diversified industrial products, held Eaton's Infrastructure Technology Day and Power Technology Technology Day in Beijing. By optimizing the integration of technologies related to the electrical, hydraulic, aerospace and vehicle business segments, Products to focus on the industry and users demonstrate its application in transportation and other infrastructure construction, as well as power and energy management innovation and technology solutions to help promote China's infrastructure and energy restructuring. In order to deepen its understanding with different groups in the industry, especially its customers, Eaton regularly organizes Technology Days to share advanced technology and development experience. During the event, Curt Hutchins, President of Eaton Asia Pacific, and Zhou Tao, President of Eaton China, attended the meeting and communicated with numerous customers, industry experts and technical representatives on the site. He Qinhong said: "As the world's leading power management company, Eaton has always been committed to providing customers with safe, reliable and efficient environmental solutions to help them effectively manage the power and improve the quality of system operation, and thus the energy structure of society as a whole Sustainable development, and it clearly shows that Eaton is determined to shift from a product or technology provider to a full solution provider. In the future, we will provide more customers in China in the infrastructure construction and other segments. Targeted innovative solutions. " During the event, in addition to displaying a series of innovative products and technical services, Eaton also conducted a series of professional seminars, in-depth analysis of its application in the field of infrastructure construction and power energy management system solutions and application experience to help the region Clients will have a better understanding of the latest market conditions and technological developments in the world and also provide a more forward-looking and international perspective on the development of related fields in China. Aluminum radiators For Railway Locomotive, Aluminum, high vacuum-brazed, plate&bar Heat Exchangers which is Compact, Lightweight, High Efficient Heat Transfer. The cooler is used to cool down oil/water/air in general using air through forced ventilation on machines that operate continuously in severe work conditions. Air Cooler, oil cooler, Water Cooler are mounted side by side with motor,fan and fan shroud.